There are very few wrestling games that can stand the test of time like AKI Corp., and THQ's WWF No Mercy. This was a game that came out during the golden era of wrestling games where we had deep competition between WWF, WCW and ECW. Technically, WWF No Mercy was the last great wrestling game of that era, as Yukes took over making WWF games from then on, ECW faded from history shortly thereafter and WCW was prepping to shut its doors. Amidst all the turmoil happening around the pro wrestling scene, AKI's WWF No Mercy managed to come out on top as one of the best wrestling games ever made and it was a perfect swan song for WWF games on the N64. This list briefly details what made the game so great and why it's still being played and modded today by a dedicated fanbase who appreciated the core gameplay and features. One of the game's highlights (for which there are many) is the grappling system. AKI had been perfecting this system over the years since they first introduced gamers to their style of wrestling with WCW World Tour. Interestingly enough, the grappling system was actually centered around Japan's puroresu style of wrestling as opposed to the American style of pro-wrestling. This gave No Mercy a nice balance of struggle-based grappling where the player who initiated the grapple had the advantage, but it could easily be taken away in a sort of back-and-forth game of chess between the two players. The real cool part about the grappling system was that moves were tiered based on how long the grapple button was pressed. Short taps gave players quick moves to pull off, while holding down the button enabled players to pull off heavy moves. There was a neat risk/reward setup because more powerful moves made it easier to pin or submit an opponent at the risk of having the move easily countered, where-as quick moves did very little damage but were good for wearing down opponents, similar to Human's Fire Pro Wrestling series. No Mercy was one of the rare games where countering wasn't just something players did just to do it, nor was it some special feature where you could instantly get a “Momentum Shift” like in some other wrestling titles. Instead, the submission and countering system was finely tuned for precision gameplay. It was refined and evolved from Asmik Ace's Virtual Pro Wrestling 2 (which goes down as probably my favorite MMA/pro-wrestling game of all time), where there were tiers to counters and some submissions. This could vastly change the outcome of a match because a player playing a good counter-game could easily score a victory by slip-ups of an opponent. In order to maintain some kind of balance for the system, it was setup so that – much like Virtual Pro Wrestling 2 – various wrestling/fighting styles, when matched up against each other, could afford for different types and styles of counters. This meant that a wrestler focusing on mat wrestling could easily or quickly counter grabs into a submission hold, where-as someone who was classified as a martial artist or striker could reverse moves into powerful strikes. The countering system created an interesting dynamic between certain play styles. While talking about grappling, submissions and counters, one of the things that made those aforementioned features stand out in the way that they did was because of all the moves that fleshed out the game's play mechanics. This here was one of the coolest highlights because the game offered multiple wrestling styles to choose from and each style had its counter-system, while some styles also had their own move sets (some moves or counters were also determined by a player's weight). The animation system for the moves is what made it such a great thing because the character movements were exceptionally smooth (when the frame-rate was getting killed) and AKI basically kept hold of all the move-sets from their previous games and just kept adding on and expanding the content for No Mercy. 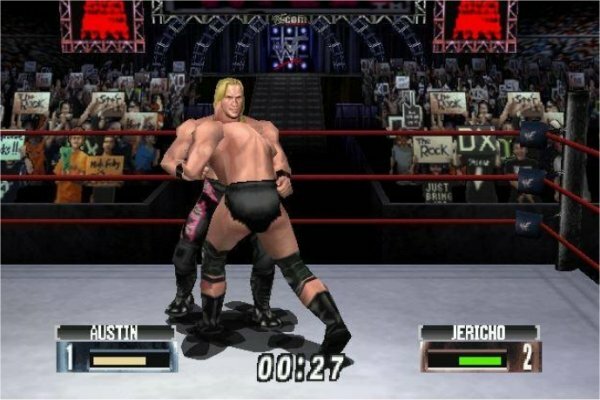 Instead of using motion capture techniques that Acclaim and EA were using for their wrestling titles, AKI opted for hand-animation that allowed for a much lower memory threshold and, in turn, enabled them to add thousands of moves to the game. Back in the day it was rare in a wrestling game to enable players to modify or edit the wrestling superstars already in the game. There are a few games that allow for that feature, but back in the 1990s it was a feature that really helped AKI's titles stand out. You could put your favorite superstar in all sorts of ridiculous or cool outfits, or even change certain aesthetic characteristics, like removing Kane's mask. As for player customization... WWF No Mercy was one of those games where you didn't get a whole lot to choose from as far as miniscule details go: you couldn't modify your face features all that much and body types were fairly generic. However, what the game lacked in visual depth it made up for it with plenty of ring gear options, tattoos, some decent hair styles and cool attribute system to determine how your character excelled in the ring. The big difference between MMA and pro wrestling is that in the latter's case it's all about pageantry and presentation. A lot of wrestling games don't really seem to understand this aspect of sports entertainment. Thankfully, AKI knew how to implement cool story elements into the game's story mode and other gameplay modes to help flesh out the match psychology and in-ring storytelling elements. This meant that something that happened in a backstage segment could play into something that eventually spills into the ring, or vice versa. The real highlight was how the storytelling affected the matches. If you were involved in a backstage segment where someone used a bat and went to work on your character's leg, it would affect your character's leg in the following match. This meant that you were susceptible to easily tapping out to a leg submission. This kind of cohesive mixture of pro wrestling drama with in-ring match chemistry meant that players had a lot of different ways to approach the way matches unfolded and tell some interesting stories from within the confines of the squared circle, almost like in real life. Maybe some time down the line we'll finally get another wrestling game that houses the same kind of dedication and prestige that AKI poured into their games.